The Master Gardeners of Greater New Orleans Speakers Bureau is a free community outreach service providing educational programs in Louisiana horticulture to groups and organizations. Speakers are Master Gardener volunteers who have completed the Louisiana Master Gardener training provided by the LSU Cooperative Extension Service. 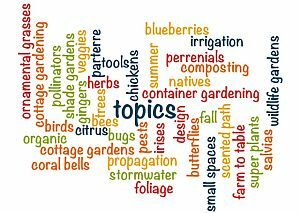 Programs are selected and prepared by Master Gardeners that reflect both their expertise and interests. Master Gardeners will speak to groups in the Greater New Orleans area. Garden clubs, schools, businesses, churches, neighborhood and civic organizations are invited to take advantage of this learning opportunity. Most programs are delivered as PowerPoint presentations and typically last approximately 30 minutes. To request a speaker, please follow the procedures listed below. Note that effective June 10, 2017, our procedures have changed. You can now submit your request by email directly to the speaker of your choice. How to submit your speaker request? Open/download the selected Speaker Request Form (at right). You will need Adobe Acrobat Reader to do so. A link is provided at right to download it if needed. Save to desktop: Click “Save a copy…” (top far left icon). Change name of file: to MGGNO Speaker Request _ Your Garden Club Date of Meeting.pdf (Example: MGGNO Speaker Request _ NOLA Garden Club Oct 6 2017.pdf). Attach your completed form to an email to the email address of the selected speaker (from Speakers: Bios and Topics) and include “Speaker Request” as your subject. Have a question about our Speakers Bureau? Please email speakers@mggno.com.